Although the discovery needs to be confirmed by direct measurements, the previously unknown canyon system is thought to be over 1,000km long and in places as much as 1km deep, comparable in depth to the Grand Canyon in USA, but many times longer. The canyon system is made up of a chain of winding and linear features buried under several kilometres of ice in one of the last unexplored regions of the Earth's land surface: Princess Elizabeth Land (PEL) in East Antarctica. Very few measurements of the ice thickness have been carried out in this particular area of the Antarctic, which has led to scientists dubbing it one of Antarctica's two 'Poles of Ignorance'. Lead researcher, Dr Stewart Jamieson, from the Department of Geography at Durham University in the UK, said: "Our analysis provides the first evidence that a huge canyon and a possible lake are present beneath the ice in Princess Elizabeth Land. It's astonishing to think that such large features could have avoided detection for so long. "This is a region of the Earth that is bigger than the UK and yet we still know little about what lies beneath the ice. In fact, the bed of Antarctica is less well known than the surface of Mars. If we can gain better knowledge of the buried landscape we will be better equipped to understand how the ice sheet responds to changes in climate." Co-Author Dr Neil Ross from Newcastle University in the UK, said: "Antarctic scientists have long recognised that because the way ice flows, the landscape beneath the ice sheet was subtly reflected in the topography of the ice sheet surface. Despite this, these vast deep canyons and potential large lake had been overlooked entirely. "Our identification of this landscape has only been possible through the recent acquisition, compilation and open availability of satellite data by many different organisations (e.g. 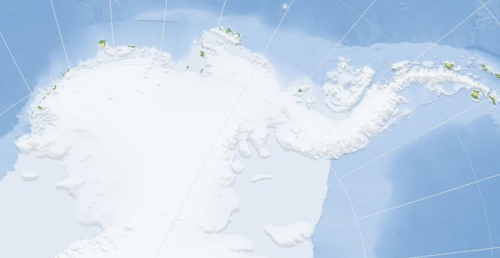 NASA, ESA and the US National Snow and Ice Data Center), to whom we are very grateful, and because of some serendipitous reconnaissance radio-echo sounding data acquired over the canyons by the ICECAP project during past Antarctic field seasons."